After 4 months of mourning and 7 days of funerals, Cambodians finally bade goodbye with tears their beloved “King-Father” Norodom Sihanouk, who died of a heart attack in Beijing on Oct. 15 (2012) at the age of 89. 4 months of elaborate Buddhist rites that culminated with the golden coffin, carrying the embalmed body of the late king, paraded through the streets of Phnom Penh (lined with thousands of mourners paying their last respects) and a sumptuous cremation ceremony held in the crematorium built nearby the Royal Palace, at the presence of numerous foreign heads of state. 20/10/2012 - Phnom Penh. 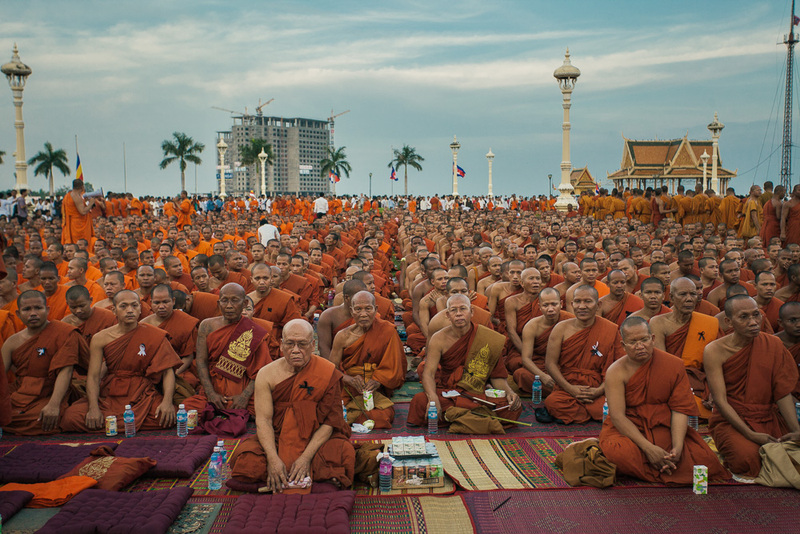 About 3,500 monks pray the death of the former king Norodom Sihanouk, in front of the Royal Palace of Phnom Penh. 19/10/2012 - Phnom Penh. 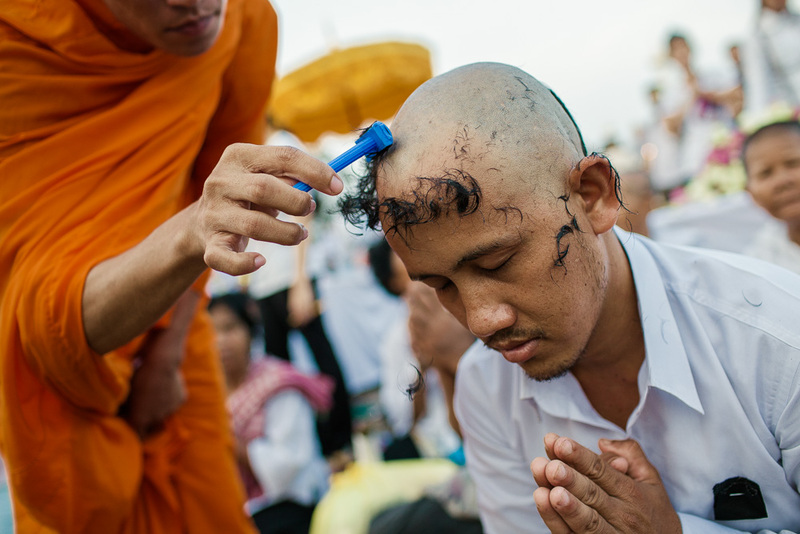 A man has her head shaved by a monk to mourn the passing of former King Norodom Sihanouk outside the Royal Palace, on the second day of his mouning. 19/10/2012 - Phnom Penh. Thousands of Cambodians gather in front of the Royal Palace to pay their respect to the former king Norodom Sihanouk. 19/10/2012 - Phnom Penh. A young girl cries the death of the former king Norodom Sihanouk in front of the Royal Palace. 19/10/2012 - Phnom Penh. A portrait of the former Cambodian king Norodom Sihanouk left in front of the Royal Palace. 30/11/2012 - Phnom Penh. Construction workers build the load-bearing structure of the crematorium in which the late king Nordom Sianouk will be cremated. 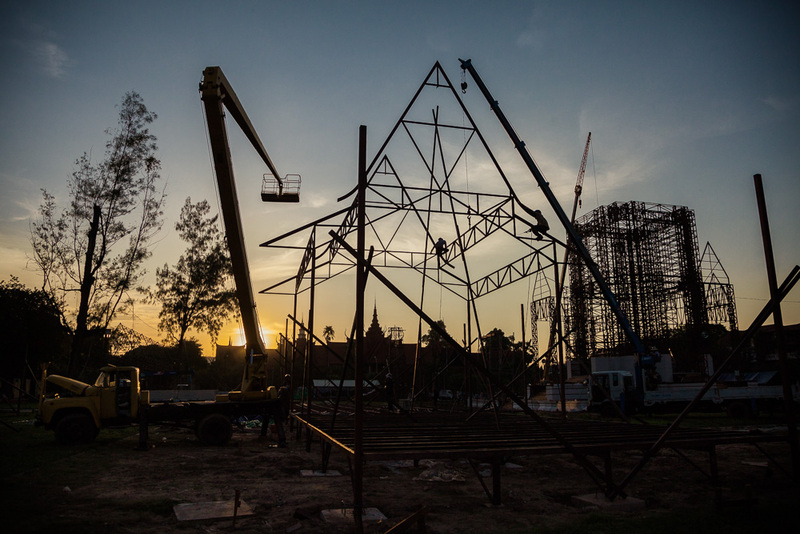 The structure costed $1.2 million and will be dismantled in keeping with Cambodian tradition. Phnom Penh (01/02/2013). The final touches are made ahead of the start of the funeral of the former Cambodian King Sihanouk. Phnom Penh (01/02/2013). A security agent scans a group of Buddhist monks ahead of the start of the funeral of the former Cambodian King Sihanouk. Phnom Penh (01/02/2013). 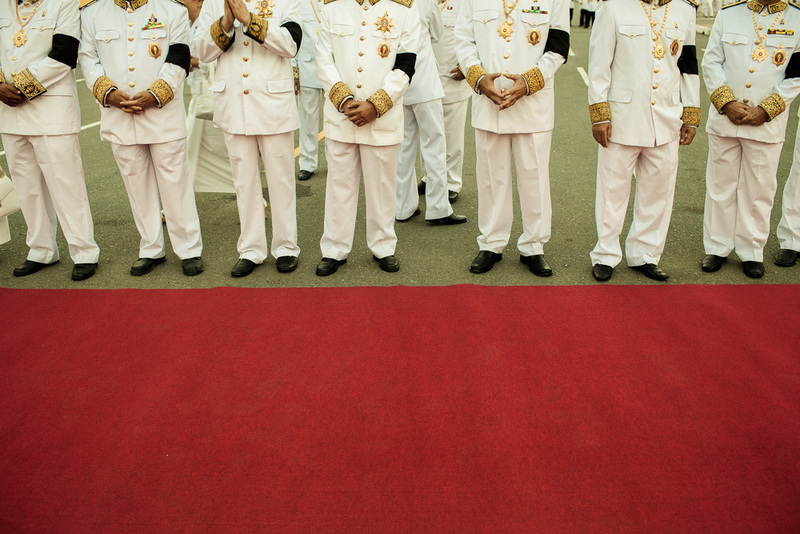 Latest retouches before the celebrations of the funeral of the former Cambodian king Sihanouk start. Phnom Penh (01/02/2013). The golden coffin carrying the embalmed body of the former King Sihanouk, comes out the Royal Palace of Phnom Penh surrounded by the higher echelons of the Cambodian Army. Phnom Penh (01/02/2013). Officials carrying images of the late king pictured ahead of the start of the funeral of the former Cambodian King Sihanouk. Phnom Penh (01/02/2013). The golden coffin carrying the embalmed body of the former King Sihanouk is paraded around the streets of Phnom Penh filled with thousands of people paying their last respects as the royal funeral rites get underway. Phnom Penh (01/02/2013). Cambodian King Norodom Sihamoni and Queen Norodom Monineath Sihanouk, pay their respects to the late former King Sihanouk just outside the Royal Palace of Phnom Penh. Phnom Penh (01/02/2013). An official rests after the ceremony in which the golden coffin, carrying the embalmed body of the former King Sihanouk, is paraded around the streets of Phnom Penh, filled with thousands of people paying the latest respects. 02/02/2013 - Phnom Penh. Bun Rany, wife of P.M. Hun Sen, enters the crematorium site ahead of the start of a private ceremony in which the king Norodom Sihamoni and Queen Norodom Monineath Sihanouk will pay their respects to the late Cambodian King Sihanouk. 02/02/2013 - Phnom Penh. King Norodom Sihamoni and Queen Norodom Monineath Sihanouk pay their respects to the late Cambodian King Sihanouk in a private ceremony held in the afternoon of saturday in the crematorium built nearby the Royal Palace of Phnom Penh. 03/02/2013 - Phnom Penh. Thousands of Cambodians are lined in front of the Royal Palace of Phnom Penh to enter the Crematorium and pay their last respects to the late king Sihanouk, on the third day of his funeral. 03/02/2013 - Phnom Penh. A young boy sells lotus flowers in front of the Royal Palace, some hours before the cermony of cremation of the late king Norodom Sihanouk. 05/02/2013 - Phnom Penh. Print shop workers make posters and gadgets with the photos of the late Cambodian King Norodom Sihanouk, during the cremation ceremony of his body. 05/02/2013 - Phnom Penh. A woman clears the floor in the front of the Royal Palace of Phnom Penh, minutes before the beginning of the ceremony of cremation of the late Cambodian king Norodom Sihanouk. 05/02/2013 - Phnom Penh. Thousands of Cambodians wait for hours in the river side of Phnom Penh, the beginning of the ceremony of cremation of the late Cambodian king Norodom Sihanouk, as Police secured the area around the Vela Meru - the crematorium site. 05/02/2013 - Phnom Penh. Aerial view of the crematorium built nearby the Royal Palace of Phnom Penh, minutes before the cremation of the body of the late Cambodian King Norodom Sihanouk. 05/02/2013 - Phnom Penh. Cambodian women cry after the ending of the ceremony of cremation of the late King Norodom Sihanouk. 05/02/2013 - Phnom Penh. Smoke comes out the chimney of the crematorium minutes after the end of the cremation ceremony of the late Cambodian King Norodom Sihanouk. 05/02/2013 - Phnom Penh. 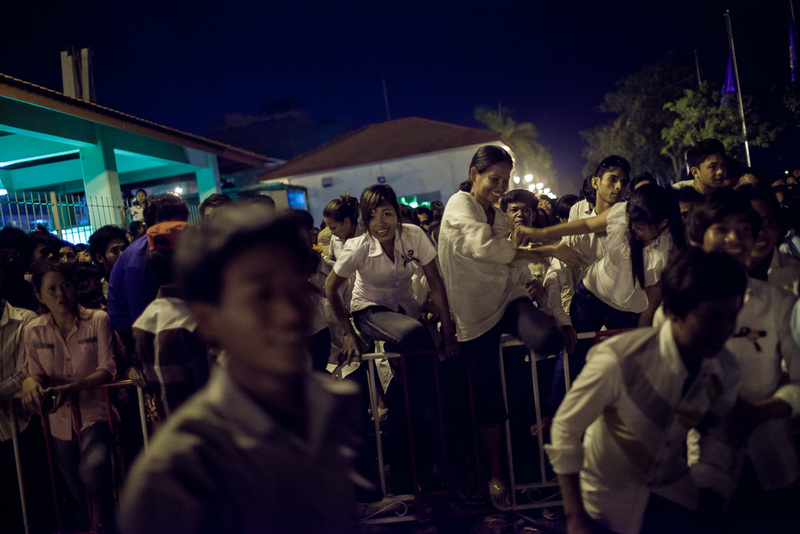 Thousands of Cambodians who waited for hours in the river side of Phnom Penh, climb over the fences, minutes after the end of the ceremony of cremation of the late Cambodian king Norodom Sihanouk.